EtherCAT COOL MUSCLE Bridge User’s Guide has been updated. Music video of “Robotic Choreographer” , which is jointly developed with mplusplus Co., Ltd. has been released on YouTube. The utility software dedicated to EtherCAT COOL MUSCLE Bridge has been completed. New Leaflet of "EtherCAT COOLMUSCLE Brdige" is available now. Osaka Institute of Technology Umeda Campus First floor exhibition started. From the opening of Grand Front Osaka, MUSCLE has been displaying our development products at the ACTIVE Lab in the North Building,but closed the venue on April 14th. 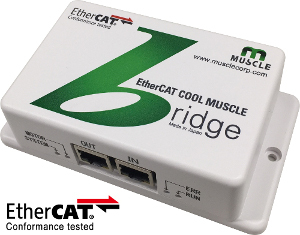 The EtherCAT COOL MUSCLE Bridge, EtherCAT interface for COOL MUSCLE, is officially released. MUSCLE CORPORATION renewed the company logo. The website was updated along with the logo change. Muscle sincerely expresses our deepest sympathy to the victims of the earthquake in Kumamoto in Japan. COOL MUSCLE 2 is CE certified now and product No# is updated. Update download pages by the CE change. A Flash plug-in is necessary for reading of contents. Copyright (C) 2006 MUSCLE Corporation All rights reserved.